The What: Listen Technologies will be exhibiting in Booth 3-A110 at ISE 2016. The What Else: ListenWiFi allows users to listen to up to 24 channels via a Listen Wi-Fi Access Point using their own smart devices in a variety of venues. ListenWiFi lets venues such as fitness clubs offer a personal listening/viewing experience by streaming audio content from any TV or audio source directly to their customers’ smartphones and tablets using a Wi-Fi network. The ListenWiFi Personal Listening system, designed by Listen Technologies, delivers unprecedented audio quality, manageability and flexibility as it can be configured with four to 24 channels without having to replace the server. Users simply download the app via the App Store or Google Play, connect to the WiFi network and tune into the channel displayed on the TV they are interested in—no need to unplug or change channels when they change machines. Users tune-in using their own device with their own ear buds. 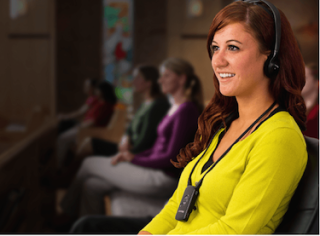 The ListenIR iDSP assistive listening system offers exceptional infrared (IR) coverage and the most cost-effective and easy to install solution for assistive listening, language translation or other wireless audio applications. It performs like no other IR system on the market, with RF-like sound, twice the power and massive coverage, transmitting clear, focused audio privately to the intended audience and no one else. It’s perfect for secure assistive listening in smaller spaces such as classrooms, courtrooms, corporate meeting rooms, and theaters. The iDSP IR Receiver offers precise clarity with 20 dB less hiss than comparable products. The integrated neck loop/lanyard improves the experience for people who have hearing aids and cochlear implants with telecoils. iDSP IR receivers are the smallest of their kind, making them easier for venues to store, charge, and distribute; it also makes it easier for end users to wear and operate. Additionally, iDSP IR receivers use lithium-ion battery technology with battery management, eliminating the cost and hassle of traditional AA alkaline batteries. The Bottom Line: Listen Technologies will be exhibiting in Booth 3-A110 at ISE 2016.